If you could only have one of the following for your child(ren), which would you choose, health insurance or an expanded tax deduction? The government just made this choice for you and you’re getting a bigger tax credit as a poor attempt to compensate for the expiration of funding for the Children’s Health Insurance program — nine million children are losing their coverage as a result. Meanwhile the expanded child tax credit is only temporary, only good for about seven years, according to the Tax and Jobs Act that President Donald Trump signed into law last week. If anything, the child and dependent care tax credit has gotten more complicated, and appears to favor families with younger children, along with the wealthy. 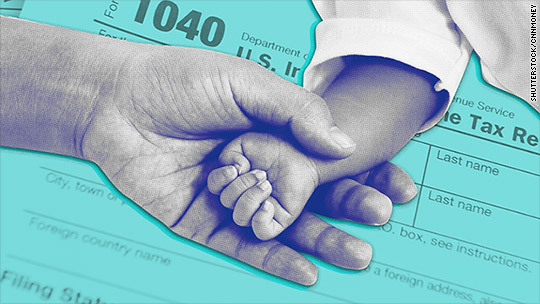 Families with children would see their taxes fall, on average, by $2,570 in 2018. The poorest 20% of families would see a tax cut averaging $210 until 2027, after which point all but $50 of the cut would evaporate. The new law includes a credit of $2,000 per qualifying child under 17 years old, and $500 for each additional dependent, and begins to phase out for those with $400,000 income filing jointly. The refundable portion of this credit is 15% of earnings in excess of $2,500, amounting to up to $1,400 per child. When all of these changes to the child and dependent care tax credit sunset in 2025, the terms of the current law return. The current law includes a credit equal to $1,000 per child under 17 that phases out above $75,000 in annual earnings for those who file as single and $110,000 for those filing jointly. The refundable portion equals 15% of earnings in excess of $3,000. Whether the current law or the new one contains a more generous child and dependent care tax credit depends on the number of dependents in a household, total income and whether filing as single or joint. Unfortunately, the child and dependent tax credit apparently isn’t enough to offset what appears to be higher overall taxes for some of the poorest U.S. households, according to analyses by the Tax Policy Center of the Brooking Institute. Readers, what are you expecting to see in your next tax return as a result of the changes?